The azimuth is the horizontal angle from true north in a clockwise direction , or bearing of the satellite from the antenna . Obviously, the azimuth of the antenna must match the azimuth of the satellite, or it will not acquire the satellite. This satellite azimuth depends only on the satellite longitude and the position of vessel. The most common reasons for an antenna not finding the satellite is that it is pointing to the wrong place in the sky. This could be due to compass error, antenna alignment errors, the wrong ship position from the GPS, or the wrong satellite longitude selected. 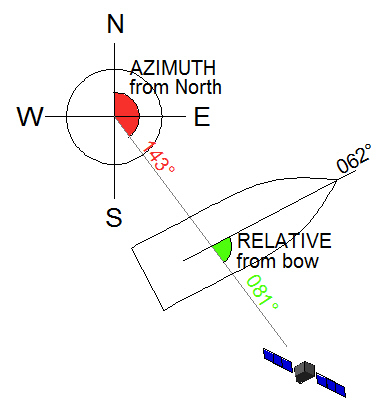 Relative azimuth is the bearing of the satellte referenced from the bow of the vessel, in a clockwise direction. This is computed considering the ship's heading and the Azimuth. The Azimuth is counted clockwise from North through 360 degrees. The Azimuth does not change unless the ship moves to a different location. The azimuth stays the same as the ship turns. The Relative is counted clockwise from the bow through 360 degrees. The Relative changes with heading, as the ship turns. 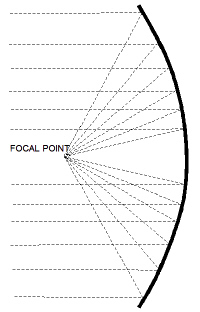 Elevation is the pointing angle from the horizon to the satellite. The elevation and azimuth are calculated by the antenna based on the GPS position of the vessel and the Satellite longitude, nothing else. Zero degrees is looking at the horizon and 90 degrees is looking at the zenith (or directly overhead). The parabolic dish focuses the weak signals from the satellite to the center of the feed. With any reflective surface, the angle of incidence is equal to the angle of reflection. Whatever angle the signal hits the dish it will bounce back off at the same angle. The shape of the parabola is such that the signals coming in from the satellite are reflected off the surface toward a common focal point. In the same way, the transmit signal from the feed toward the dish is reflected back in a parallel beam toward the satellite. Automatic Gain Control. The signal strength of the received signal. The term originates from a reference voltage in radio receivers that would automatically turn down the gain of the receiver as the signal increased. Today in satellite terms it refers to the strength of the signal. On a SeaTel antenna, for example, you may have an AGC of 1400 when you are off the satellite, and 1800 when you are on the satellite. The importance is the difference between these two levels and not necessarly the actual level. Block Up Converter is the transmitter of the antenna system. It converts the IF frequencies up to RF frequencies and amplifies the signal for transmission by the antenna. It contains an upconverter that changes the frequency from the IF frequency (usually L-Band) up to the RF frequency (C-Band, Ku-Band or Ka-Band). It also has the final power amplify that boosts the signal to the transmit power level. It is called a BLOCK up converter as it converts the entire block of signals from the IF to RF frequencies. (A regular up converter would only convert a narrow band of the required signal to RF frequencies). The LNB is the radio receiver of a satellite antenna system. Depending on the type of feed, the LNB is installed either in front of, or behind the dish. It receives high frequency radio signals from the satellite and converts them to, more easily managed, intermediate frequencies. Super high radio frequencies, like Ku-band and C-band, are extremely sensitive to losses and noise, thus requiring sophisticated and expensive equipment and cables to process and transport the signals. The LNB, converts the higher frequency radio signals, recieved by the dish, to lower, intermediate frequencies, that can be handled and transported using lower cost equipment and cables, down to the satellite receiver, or modem. LNB stands for Low Noise Block converter, because it converts the entire block or range of Ku-Band or C-Band signals received from the satellite, down to a range of IF frequencies, usually L-band(1.5Ghz) in the case of Ku-band systems, and 70Mhz in the case of C-Band systems. VSAT- ALWAYS ON - FIXED PRICE. Technically, all parabollic dish satellite terminals less than 3.8 m could be called Very Small Aperture Terminals, or VSATs, but the term VSAT generally refers to transmit/receive (TX/RX) satellite terminals used for two way, data and voice traffic, like internet and telephone. A VSAT service is typically billed on a monthly contract, rather than by the minute, or by the megabyte like Inmarsat satcoms. 93651 visits to this page since 28 Nov 2012.